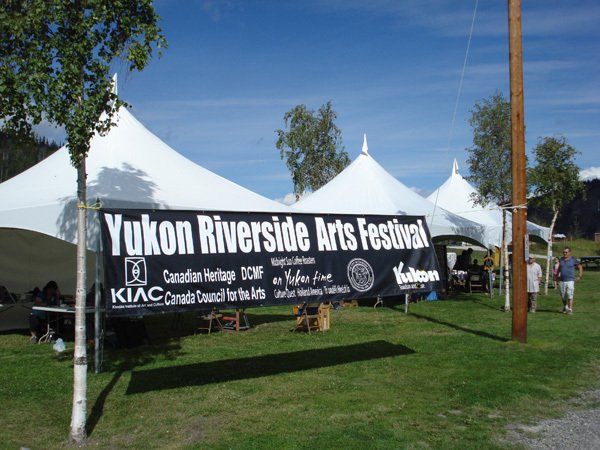 For the last ten years our Dawson City Arts Society has organized an arts festival in conjunction with the Discovery Days holiday in August. Discovery Days is about remembering the discovery of gold on the creeks and the beginning of the Klondike Gold Rush in 1896. It’s a three day event that covers a lot of ground, beginning with an art walk around town on the Thursday night. This year there were 10 gallery hop locations featuring diverse work. Terrific workshops were available all weekend such as making antler jewelry, basswood carving and mosaics just to name a few. 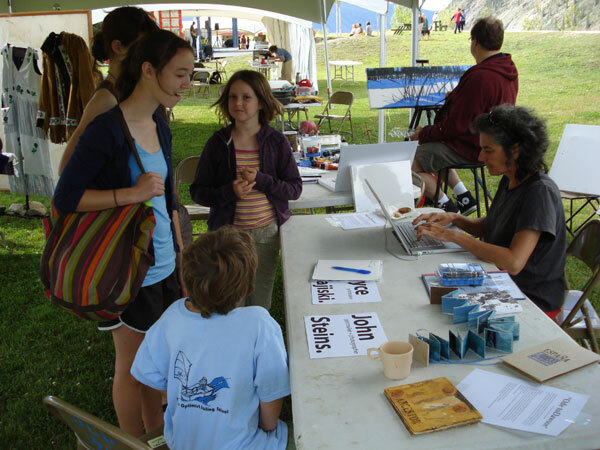 Here’s my co-conspirator and fellow printmaker Joyce Majiski (sitting down) gathering data for our collaboration called “Ode to Dawson”. Using both traditional and newer methods we involved about forty people over the weekend to make a very cool accordion style folding book. As smaller example is shown on the table next to Joyce. That’s Whitehorse painter John Boivin in the background at the easel working on a new piece. He held a Plein Air workshop over the weekend. People came to our table to give us their text, make a quick lino-cut or offer a photo. Somme added their two cents directly onto the book. Here’s a new use for the versatile iPhone. 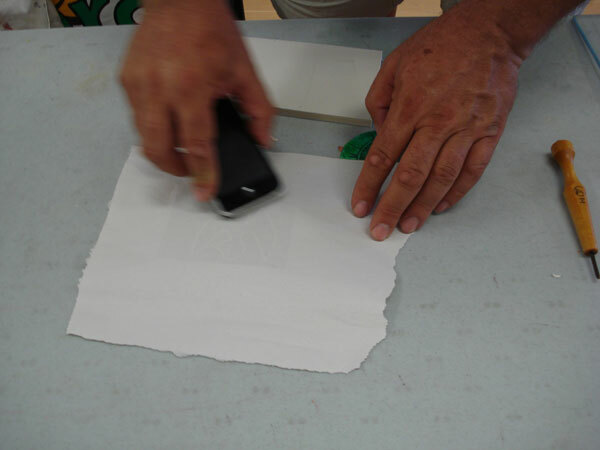 this participant used his as a burnishing tool to proof his print as a contribution to our project. Now I really have to get one of those phones! And, the finished product. The other side of the book is filled up as well.In the foreground you can see the booklet version that can be downloaded as a pdf with instructions on how to fold, cut and bind together. The link is at the end of this post. Joyce and I did some over-printing on digital content and vice versa with monotype on the etching press along with direct relief printing and scanned linos as well. We were hopping between my studio, the printmaking space at the art school as well as the festival site on the dike. We used BFK Rives paper torn in half lengthwise. 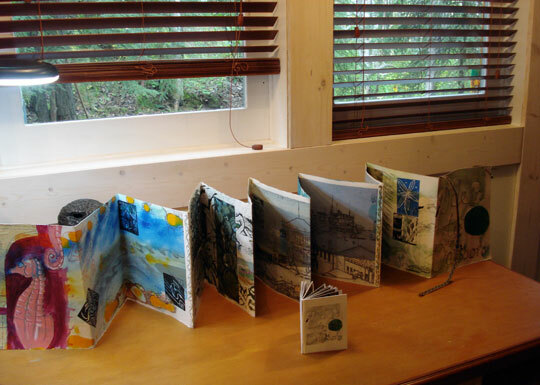 The four sheets were folded in thirds and were stitched together with Meshell Melvin and her Universal Movement Machine. 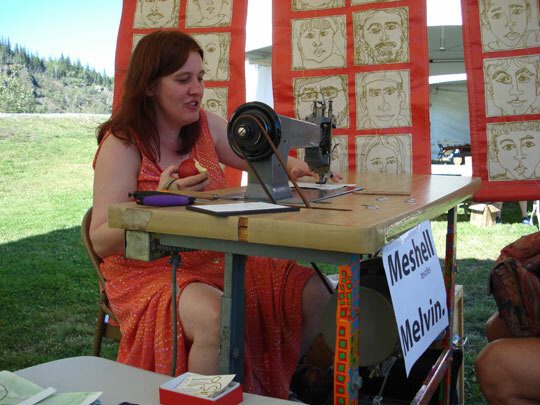 Meshell does amazing work with her specialized stitching machine. Here she’s doing portraits for people. As I mentioned, she stitched our book together as well as enhancing some of the pages. This is the down-loadable version of our collaborative project, albeit smaller in size it shows all the pages and can be folded, cut and bound according to the included instructions to make a sweet little booklet. All from a pdf document! Thanks and gratitude go to the folks at bookleteer.com for providing the free online software that does all the heavy lifting, making a series of images into a booklet one can put together so easily. 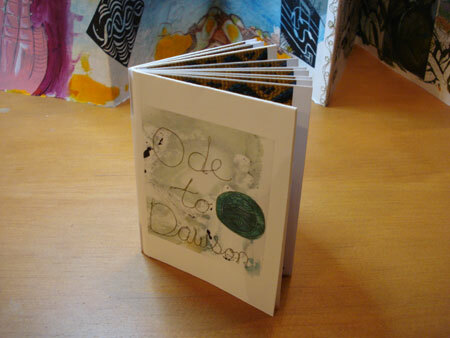 Here’s the link for the Ode to Dawson Booklet if you want it.